This was an instant hit. Even though he didn’t help me make it , it has been played with a ton. I think I may have a young Willard Scott on my hands. 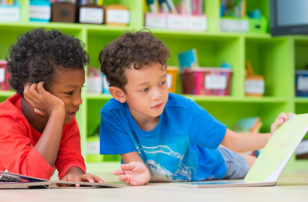 As a teacher I included checking the weather in my daily circle time, even with kids as young as 2 this sparks interest in science in a way that is relevant to their daily lives. Gather your materials. 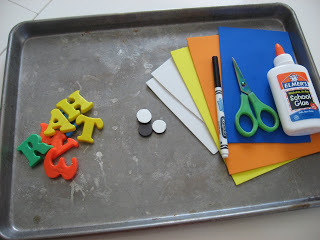 You will need a magnetic surface ( or cookie sheet), some magnetic letters, 4-5 sheets of foam, 4 magnets , a marker, scissors and glue. 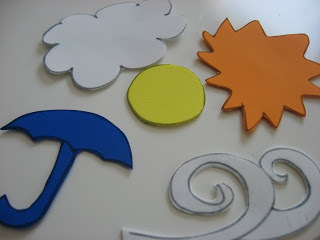 Start by drawing a sun, wind, cloud and a rain drop or umbrella on the foam. Had it been winter when we made this I’d add in snow. Add the magnets to the back with glue and let dry. Please remember if you are doing this with little ones that are still putting things in their mouths, use long flat magnets not ones that could be swallowed, or pose a chocking hazard. 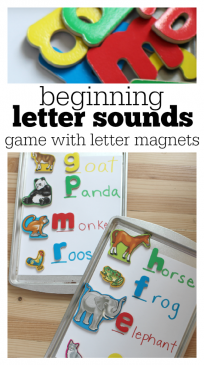 Adhesive magnetic sheets are a great option too. Add your signage, we only had one E, so a backwards 3 works in a pinch. And choose the appropriate magnet to put up. 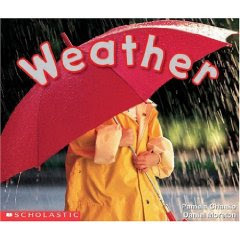 ” Weather”by Pamela Chanko and Daniel Moreton is the perfect little non fiction book about weather for toddlers and young preschoolers. It’s short and has big interesting photos depicting different weather. Don’t be fooled, it looks like nothing, but trust me little guys will ask you to read it again and again. It’s important that children get read a variety of things, not simply fiction, so don’t be afraid to get your child a simple little non fiction book like this one! 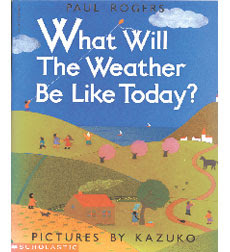 “What Will the Weather Be Like Today?” by Paul Rodgers is another wonderful weather book. It takes readers to all different environments from desserts to deep in the ocean and talks about the weather or lack of weather in each. I like the illustrations and the rhyming text, as well as the special section at the end of the book that uses photographs of children in different weather and asks the readers to answer questions about the photographs. 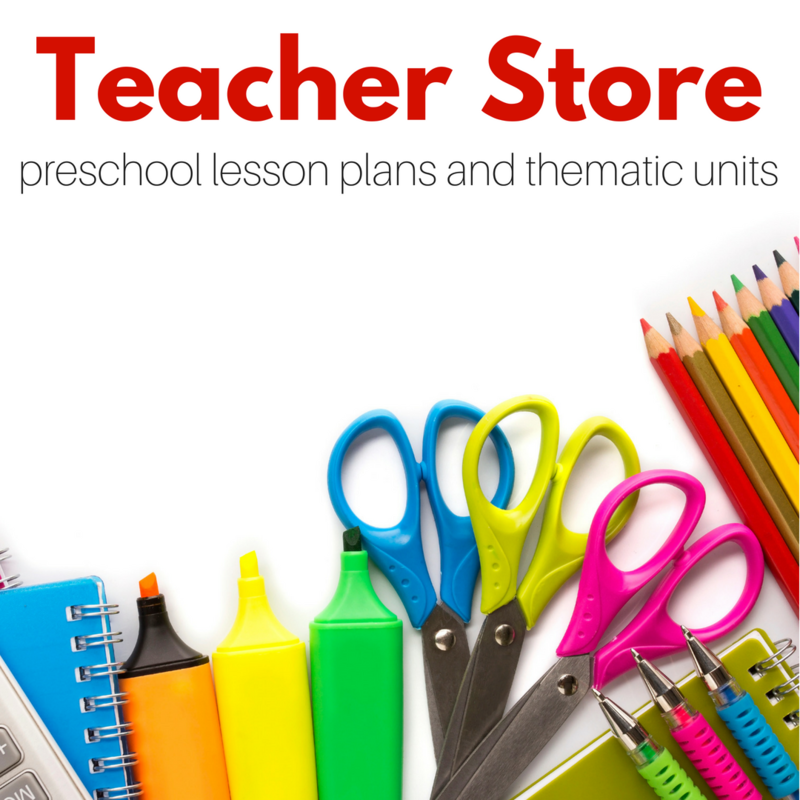 Great teaching tool for preschoolers. I love this! This is way more fun than the spinner that came in my calendar kit! We did this on our refrigerator a few months ago and Madison LOVES it! I also added "Today is …." with the days of the week magnets too. It's pretty funny when we are having a strange weather day and the rain and sun are constantly changing all day long, then Maddie is running back and forth to the magnets to switch from rain to sun! 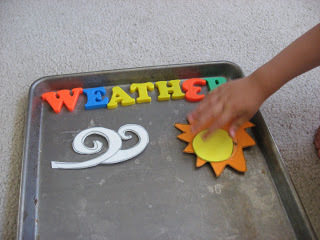 We do the weather in both my 3 & 4 yr old classes & they LOVE it. I add in the element of a graph (filling in one block for the one type of weather each day) and those kids (even the 3s) never cease to amaze me with their bar-graph reading skills! They could tell me the most, the least, ties, who was "catching up" etc…it was awesome! My daughter is so fascinated by the weather. We checked it every day with little cards but this is much more visually stimulating. Thanks for sharing this, we will be making one of these! Yay I am so glad you guys like it and that so many kids are exploring weather. Teri- I have used drinking straws to count the sunny days, cloudy days etc… they are so light you can keep a pocket full of them tacked o the wall or in a pocket chart. I love using charts and graphs while teaching. I wish i could be a fly in the wall in your class! what a great idea to make your own. I have never really found good weather stuff so this would be great for us. thanks! 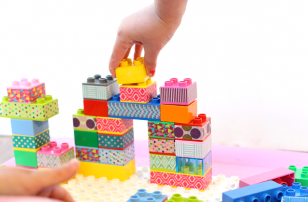 This is a great activity – I'm going to try this with my boys! How fun! Thanks. You're full of such wonderful ideas all the time. 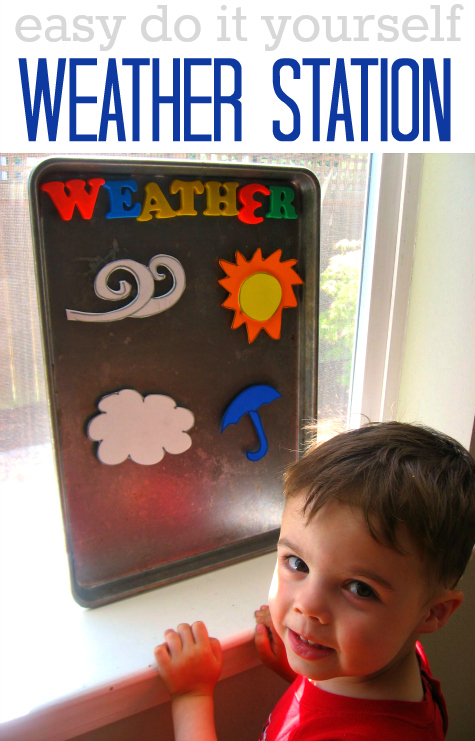 Cloudy With A Chance of Meatballs would be a fun book to use with the weather board as well! SUPER!!!!! 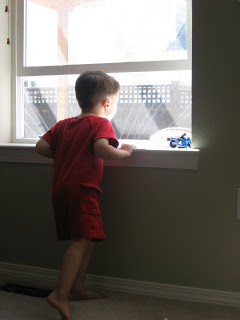 You could seriously submit this to the local news— wouldn't they love to show Mr. Mini Meteorologist!! 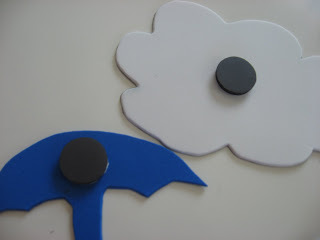 The other option is to use the small magnet but use two foam sheets and seal the magnet in the middle with hot glue. 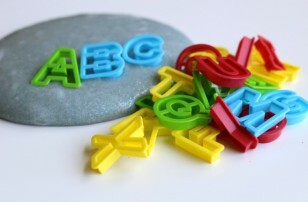 The magnet will stick through the foam and it isn't accessible for curious hands. Super cute idea. 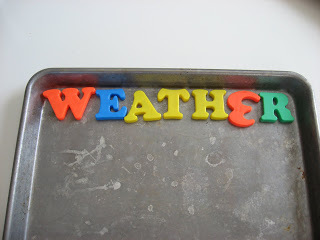 I was always fascinated by the weather (still am) and I am sure our now 4 month old will grow up to be the same. Thanks for the idea! I love this weather station. It’s simple and has tons of clarity. Many times the weather is presented with too many visuals causing it to become visually confusing. This Weather Station is a really nice approach. Great work! 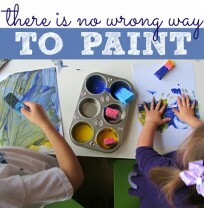 I totally agree. Less is definitely more. LOVE this! By the way, the second book recommendation is a great choice. How do I know? Because I have used it for weather units also!!! !